I first started to climb the mountain in August 1940 when as a 13-month-old boy I became stricken with polio. My family lived in Baraga, a small town about 75 miles from the only major hospital in the Upper Peninsula, which was in Marquette, Michigan. Being the youngest of three children, my parents were unable to stay in the area and were only able to visit me infrequently. I do remember hearing later that when my mother came to visit I called her Mrs. Sachs, but when my dad came to visit I called him Dad. I really didn’t know family love until I was about two years old. The hospital had numerous polio patients that summer, with many of us being confined to iron lungs. I was confined to an iron lung constructed from an oil drum. After spending about nine months in the hospital, I continued my climb up the mountain by learning to walk. With my right leg shorter than my left, and both arms affected, I learned to walk with the aid of a built up shoe and a long leg brace. Although I was allowed to go home, my parents spent countless hours with my therapy. As I grew older, I detected that my brother resented the attention I received, but my sister became my supporter and my helper. For the next few years I continued my climb up the mountain by trying to be normal. I grew up in a small town with no handicapped education classes; therefore I was encouraged to do everything the other children did. I played baseball, went fishing, walked with my dog, and tried to be as good as I could at everything. My dad taught me all the outdoor activities and my parents encouraged me to do whatever I could, with few restrictions. Between the ages of 10-14, I returned to the hospital each summer for surgery on my right leg and left arm. Usually these stays consisted of 6-8 weeks of recovery and therapy. Again my parents came to visit on an infrequent basis. Although the surgeries were of minimal help, I was able to discard my leg brace and continued to climb the mountain. My parents moved to Wakefield, Michigan, another small town, before I started 8th grade. As with my previous school there were no handicapped education classes, so I continued in the general education classes. In high school I was unable to participate in sports, so I became involved in activities that did not require physical strength. One such activity was the Future Teachers of America Club, which led to my life’s work as a schoolteacher. Several of my teachers encouraged me to become a teacher and my brother, who graduated from college my senior year, introduced me to several friends that were becoming elementary teachers. After high school, I again found myself in Marquette, but this time I was a student at Northern Michigan University. Along with my studies, I was a four year member of Alpha Phi Omega, a National Service Fraternity, where I received an Outstanding Member Award my senior year. I also worked as an Assistant Boy Scout Master with a local troop. After finishing college with an Elementary Teaching Certificate and a Master Degree in Educational Leadership, I continued my climb. I moved to the Detroit area and worked in a small suburban district for three years before moving to Livonia. In Livonia, along with my teaching duties, I became active in the Livonia Education Association, the teachers union, serving as a building representative and as a member of the Board of Directors. During most of my 39 years in Livonia, I was the building math representative. I also helped write an elementary individualized math program, served on several math textbook selection committees and helped write the district elementary math objectives several times. Throughout my career, I have served as a mentor for numerous pre-student teachers, student teachers and beginning teachers. I also was the “teacher on charge” when the principal was out of the building. This climb continued until about five years ago, which was about 58 years after I had polio. At this time, I experienced sudden weakness in my right arm, which was my good arm. I continued to work, but for the first time in my life, I had to ask for help from my colleagues. Although there were no formal accommodations made for me, I did move my parking place closer to the building and the staff started helping me with a variety of daily activities. I had always been independent and although the help was appreciated I had to learn to adjust to my new condition. I had to start to “Come Down from the Mountain”. During the last five years, I continued to descend the mountain. This June I retired from teaching and now I am trying to follow the post polio precept “conserve to preserve”. I have changed my focus from putting teaching first to putting my well being first. I have much less stress and I am using my energy to continue my daily activities. Being a true “type A” person, it has not been easy coming down the mountain. I can only hope that I have reached a plateau and can continue to help those around me. I have joined a retired school personnel group and recently have become a greeter at the St. John Post Polio Clinic. 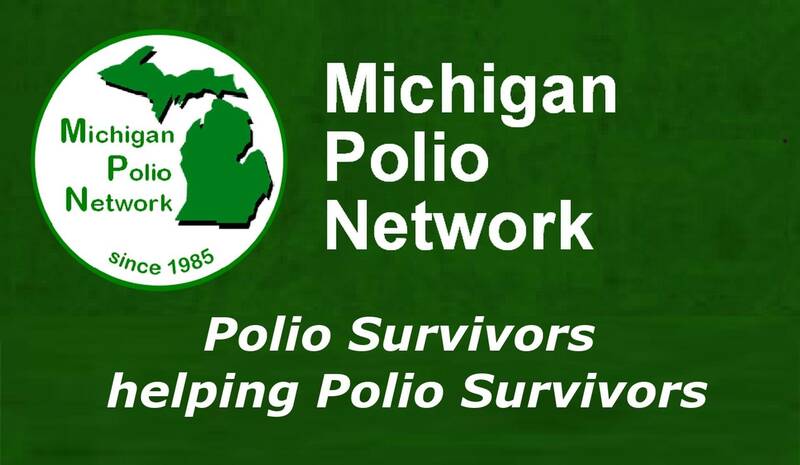 Since my retirement in June 2003, I have continued to be a greeter a the Post-Polio Clinic in Warren, Michigan, a co-facilitator of the Southeast Michigan Post-Polio Support Group, and now serve as Chairman of the Michigan Polio Network. My wife, also a polio survivor, and I have participated, the last four Septembers, in the “Post-Polio Wellness Retreats” at Bay Cliff Health Camp, Big Bay, Michigan. We have also attended several International Post-Polio Conferences. Although post-polio syndrome had continued to affect my physical wellbeing, I continue to slowly “Come Down From the Mountain”.